A smooth ride is not a measure of the quality of suspension. For performance and price, you won't find a better combination than Koni yellows and Ground Control sleeves. Can't adjust the Koni yellows though, that's a factor for me. Not sure what you mean by this but you can adjust the Koni yellows. They come with a little adjust knob and you just turn the valve on the top of the strut. I mean adjusting ride height, you can't adjust the koni set up right? I will just leave this here, not sure if you missed this part. Oh, so they are adjustable! Cool! Not much of an update, but I replaced my oil pan gasket because I had an oil leak. I still had a much smaller leak after the pan gasket and I found my oil pressure sending unit leaking. Update on my Accord, nothing to report. It has been sitting untouched since April with the dash cluster ripped out, no radio and a bad main relay. I have been busy with my Civic and working 2 jobs so I haven't had much time for my Accord. 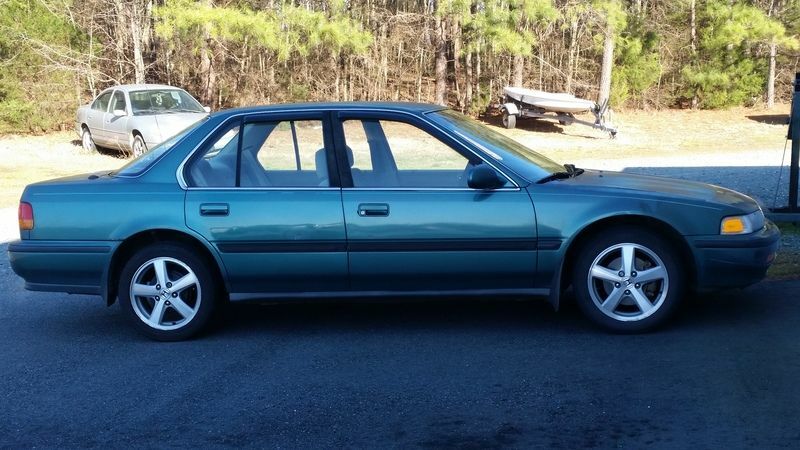 I bought a 98 Accord cluster and I will attempt to wire it in asap, I am not in a hurry as this car is no longer my daily driver. Last edited by talonted1990; 07-25-2018 at 08:16 AM. Just noticed I didn't post a pic after all of that work, needs moar low. I Like it, ive always wanted to do a 5 lug conversion but that’s as far as that went, but awesome work and the wheels and tires look good too. Plans to lower it in the works? Thanks, and yes I plan to lower it soon. I wanted the Ground Control/Koni setup but I am always buying and selling cars so I have to save up for it again. If I sell my 97 Civic coupe I will buy the setup for sure but I am having too much fun daily driving it. Drove my Accord to work today for the first time since April, didn't realize how much I miss driving this car. I got pigtails for my cluster and I will start to work on swapping it this weekend. I have been daily driving my Accord for the past couple weeks, my Civic has developed a slight rod knock and my Volvo needs some work. I forgot how much I enjoyed driving this car. Accord is down, Saturday on the way to work I heard a pop, then the car shifted to third and wouldn't shift anymore. It took off in third and stayed in third. I haven't had time to look at it but the trans may be toast.